A quest to find the best stock in gaming leads back to a few familiar companies from right in the heart of Las Vegas. Gaming continues to be one of the hottest industries on the market, with each of the industry's biggest companies easily outpacing the market's gains over the past year. Las Vegas Sands (NYSE:LVS), Wynn Resorts (NASDAQ:WYNN), Melco Crown (NASDAQ:MLCO), and MGM Resorts (NYSE:MGM) are each up at least 60% and even Caesars Entertainment (NASDAQ:CZR) is doubling the market's gains. LVS Total Return Price data by YCharts. The reason for success in gaming is simple: Macau has been growing like crazy and even Las Vegas is starting to improve slowly but surely. The result has been rapidly rising profits and rising stock prices as well. So, as I've done for three years now, I'm on a quest to find the best stock in gaming (find the last two years here and here). The easiest way to value gaming stocks is to look at their entire value, including both equity and debt, and divide it by earnings before interest taxes and depreciation (EBITDA), which is a proxy for cash flow. EBITDA is used because gaming companies invest billions of dollars to build resorts with the promise that those resorts will spit out cash. Below, I have the shown the inputs to this ratio as well as the enterprise value/EBITDA on the far right. Source: Company earnings releases and SEC filings. As you can see, Melco Crown is by far the most expensive followed by a virtual tie between Las Vegas Sands and Wynn Resorts and MGM Resorts being the cheapest. One thing I'm not accounting for here is that Las Vegas Sands, Wynn Resorts, and MGM Resorts don't own 100% of their Macau assets. 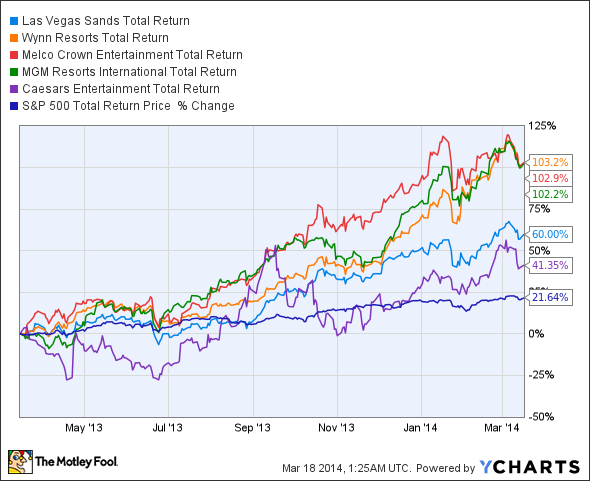 Las Vegas Sands owns 70.2% of Sands China Ltd., Wynn owns 72.3% of Wynn Macau, Limited, and MGM owns 51% of MGM China. I've also left Caesars Entertainment off the table above because I don't think it's a viable company long term. It's pushing valuable assets down to subsidiaries in an effort to retain some value in case of bankruptcy. But the operating company may still be forced to give up some of those assets if bankruptcy occurs, and I'm not willing to take the risk on Caesars's new complex operating structure. Now that we've defined a baseline for value, we need to look at growth opportunities. There may be opportunities for growth in places like Japan, but for now let's just look at the properties we know will be built. Las Vegas Sands is building The Parisian, Wynn is building Wynn Palace, and MGM is planning to finish a Cotai resort in 2016 as well. Melco Crown owns 60% of Studio City, which is expected to be an entertainment resort but is yet to get approval for table games. With the addition of one resort to the single resort each company already operates, the largest impact on earnings from the Cotai additions will go to Wynn and MGM. Each company should more than double EBITDA in Macau when the new resorts open, which puts them on the top of the list of gaming stocks right now. Las Vegas Sands simply runs into the law of large numbers when adding another resort to three already open on Cotai and four total in Macau. Another resort will be great but it won't double revenue or EBITDA, making the stock less attractive than Wynn based on current valuations. Since Melco Crown hasn't yet been approved for table games on Studio City, I don't know how financially viable the project can be. Then there's the Philippines, which is an unknown gaming market where Melco Crown is only a part owner. The market is pricing Melco Crown as if these projects will be huge successes. I see many unknowns, though, and think it's too big a risk today. We're down to Wynn Resorts and MGM Resorts as the top two stocks in gaming. MGM has the leverage to be a better stock but it also has higher risk in Las Vegas. Wynn has much higher exposure to Macau. However, it doesn't have the same leverage and is trading at a higher EV/EBITDA multiple to start with. When it's all said and done, my decision comes down to growth opportunities in Macau, where Wynn is head and shoulders above MGM Resorts. Its land concession is much larger than MGM's and it's proven the ability to generate more revenue from table games there as well. If Las Vegas grows, MGM may in fact be the better stock due to leverage, but with valuations as high as they are, I'll stick with the safer bet and that's Wynn Resorts.